The Cutillo Park and Morton Street cleanup will be held Saturday, November 10. Please join us on Nov. 10th at 10am. 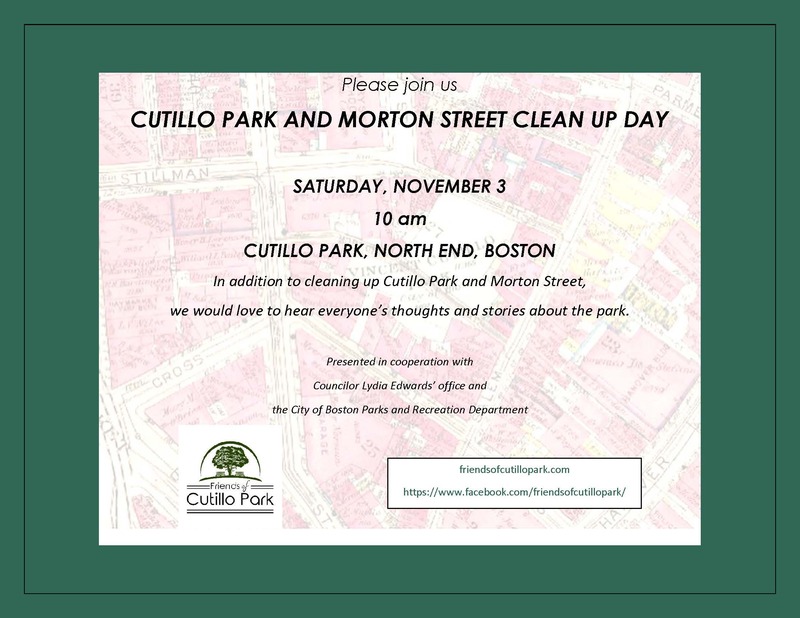 Join the Friends of Cutillo Park on Saturday, November 10 at 10 a.m. for a Cutillo Park / Morton Street cleanup day! In addition to cleaning, we want to hear everyone’s thoughts and stories about the Park. What is now Cutillo Park was taken by the City of Boston for park purposes in 1917, just over 100 years ago! Some historical information about the Park and Morton Street, including the recorded 1917 taking, old photos, and maps from 1814 to 2002, can be found on the history page of our website. Please see our Facebook page and our new website for more details. That park is an eye soar, and so isn’t Morton St.
Glad it’s gonna be cleaned up. Much needed more lights In the park at nigjt, and along Morton st.
Maybe will keep teenagers out from doing drugs and whatever else. The Park has a long history of teenagers hanging out. That said, it was a place where they and we (a bit older at the time), could collect and form community. This is what is needed for this area (like they did to the prince st park). Clean it up and make it a place with a dogpark where community will gather. Plan deliberate events here by City of Boston, like they do on the waterfront. If you want the community to buy in- show them you care about more than just the waterfront residents! Traditionally, this has been a park in the northend that has largely been ignored by the City of Boston. Completely agree. So important that this public open space is kept for the community, for purposes that serve the community. Other public open spaces in the North End (and elsewhere) have been lost as development encroaches or they are neglected or fall out of use. It’s about time that attention is given to this recently neglected park. While growing up on Stillman Street, I enjoyed the many development phases the park went through. As a very young boy, it was a wide open space and used as a ball field by the boys, and used by the young girls to jump rope and then used by Bobby Collameno Sr. for teaching many of the neighborhood kids how to play tennis; then in my early teens, it again was transformed by the City into a mound, we called “ The Hill”. During the winter months it was used as slope to sled down on; then during my late teens it was again transformed into a full blown ice skating rink by the then called Metropolitan District Commission (MDC) called the Nazzaro Skating Rink and lastly the City again transformed the park into it present configuration of children’s play area and basketball court. Many wonderful memories growing up on Stillman Street. The Park needs a group that was recently formed and my thanks to those that have taken an interest in its future use. Thank you for that history — such a small piece of land has served so many purposes for so many people over the years! Lucy, that’s a good idea. The more community activity in that park, the less the riff raft can make it a home. I know winters coming now, but brighten it up, maybe get some business to have some special events in the park etc. what better place to have it. Not to disrupt the residence or anything, their privacy should count. But they may appreciate some nice events and plus it’s a dead street. I wish they would take care of the standing water that never goes away on the basketball court. Such a cute little park gone to waste. Dogs and low life people are all you find there.